A while back I was happy to report that the Death Cap mushroom was aptly named, in contrast to so many things in life. Unfortunately, “wild ginger” is not such a plant. With a name like that you would suspect it to be related to commercialized ginger, but alas it’s not. And while the smell is appealing, the plant can do you harm. Wild ginger belongs to the family Aristolochiaceae, the Birthworts. But from here, the taxonomy is a bit confusing. Most wild ginger belongs to the genus Asarum, which was first described in 1574. But in the early 1900’s and continuing up to the 1990’s, the genus became divided and further muddled due to researchers not correctly classifying new species. It’s a mess, and not one I’m going to try to sort out. Regardless, one can find wild ginger in the Asarum and Hexastylis genera, with differences really only in minor morphology and DNA. All told, there about 80 wild ginger species, with Asia representing strong with 65, North America a distant second with 15, and Europe coming in DFL* with 1. (1). Hexastylis arifolia (Arrowleaf Ginger) with rhizome, found in Raleigh, NC. Photo by Justin Brower. A low-laying perennial, wild ginger thrives in part shade and shade areas, which makes it ideally suited for landscaping. Its leaves are heart, or kidney, shaped, and are typically green with mottled patches of green, yellow, or brown. Like commercial ginger, Asarum and the like grows from a rhizome, which is an underground “stem” from which shoots and roots grow from. 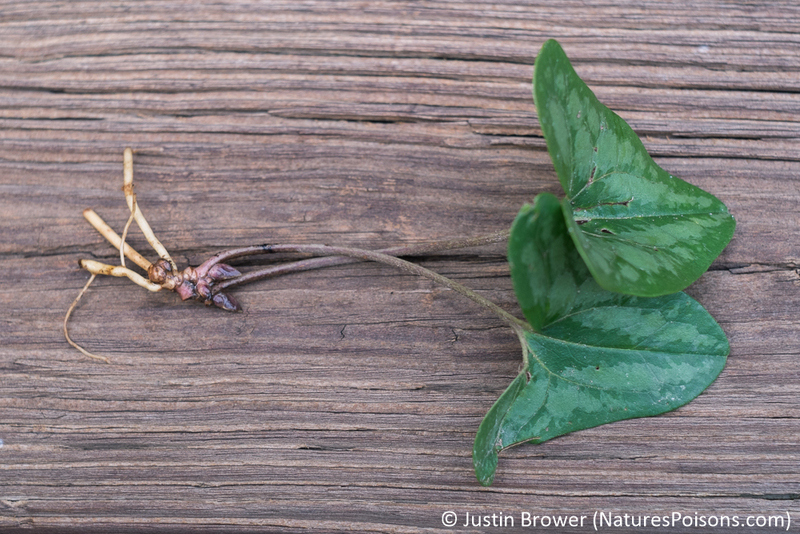 The rhizome itself from wild ginger is fragrant, and is reported to taste and smell like ginger, but the local one I am familiar with, Hexastylis arifolia (Arrowleaf ginger), seems more licorice scented to me. It’s probably because of the scent that wild ginger is used in “traditional medicine” and herbal remedies, with strong Asian ties and Native American use here in the States. Rhizomes from Asarum and its cousins contain well over 50 different aromatic essential oils, such as pinene (pine, duh), geraniol (roses), and eugenol (cloves) (2). Many of these oils and chemicals are terpenes, which is just a biosynthetic building block for many chemical structures. Think of it as a brick from Mother Nature’s Lego set. The essential oils from wild ginger has been used commercially in the flavor and fragrance industry, but in the wild, these oils act as insecticides. So far I haven’t described anything that bad, unless you’re not a fan of pretty groundcover with a pleasant smell. In traditional medicine and herbal products these plants are used as an analgesic, an expectorant, and a diuretic (for weight loss). The problem though comes from another chemical, aristolochic acid, something that plagues the entire Aristolochiaceae family, including the wild gingers. [Note the similarity between aristolochic acid and sanguinarine, from the Mexican Prickly Poppy.] The use of these herbs and plants has serious enough consequences to warrant a name for their effects: Chinese Herb Nephropathy. Nephropathy is simply kidney damage, which is straight forward enough. The “Chinese Herb” part is a bit misleading, as one can encounter these herbs and aristolochic acid outside the confines of Chinese herbal remedies. A better name would be “Aristolochic Acid Nephropathy,” which I do see used in the literature, but not as much as we should. Aristolochic acid is nephrotoxic. It damages your kidneys in acute or chronic doses, and leads to decreased kidney size, fibrosis, and impairment of renal function (3, a good review for you clinicians). Taken chronically, like in a “slimming agent”, renal failure can occur in as little as a few months. And if renal failure, which is about as serious a condition as you can find yourself in, isn’t enough, aristolochic acid is carcinogenic and strongly linked to urothelial carcinomas of the urinary tract (4). Hexastylis arifolia (Arrowleaf Ginger) found in Raleigh, NC. Photo by Justin Brower. This begs a question: what’s the safe dose of an herb from the Aristolochiaceae family and “wild ginger” genera? That’s easy . . . none. I know that will tick off some naturalists, holistics, and foragers out there, but that’s OK. The fact is we don’t know what a “safe” amount of aristolochic acid is. And don’t give me those rat studies and scale up those doses to your body weight, it doesn’t work that way. It’s more a function of body surface area, and besides, we’re not rats. And if we were, we’d find that even small, single doses are nephrotoxic (6). Couple that with variation of aristolochic acid due to environment and species (7), and we’ve got a lot of unknowns. I think your kidneys deserve better, as does the U.S. FDA, who banned importation of all aristolochic acid containing products, namely from the Aristolochiaceae family and wild ginger genera, into the United States (8). The take-home message of all this is several-fold. First, just because something is innocuously named and pleasant smelling, like “wild ginger”, one can not assume that it is safe to consume. Second, don’t assume that just because something is “traditional” or “herbal” that it is safe, or even correctly labeled for that matter. You’ve only got one life, and two kidneys, let’s keep them all in good shape. 1. Kelly, L.M. “Taxonomy of Asarum Section Asarum (Aristolochiaceae).” Systematic Botany 26.1 (2001): 17-53. 2. Motto, Michael G., and Norman J. Secord. “Composition of the Essential Oil from Asarum Canadense.” Journal of Agricultural and Food Chemistry 33.5 (1985): 789-91. 3. Cosyns, Jean-Pierre. “Aristolochic Acid and ‘Chinese Herbs Nephropathy‘” Drug Safety 26.1 (2003): 33-48. 4. Chen, C.-H., K. G. Dickman, M. Moriya, J. Zavadil, V. S. Sidorenko, K. L. Edwards, D. V. Gnatenko, L. Wu, R. J. Turesky, X.-R. Wu, Y.-S. Pu, and A. P. Grollman. “Aristolochic Acid-associated Urothelial Cancer in Taiwan.” Proceedings of the National Academy of Sciences 109.21 (2012): 8241-246. 5. Vanherweghem, Jean-Louis. “Misuse of Herbal Remedies: The Case of an Outbreak of Terminal Renal Failure in Belgium (Chinese Herbs Nephropathy).” The Journal of Alternative and Complementary Medicine 4.1 (1998): 9-13. 6. Mengs, U., and C. D. Stotzem. 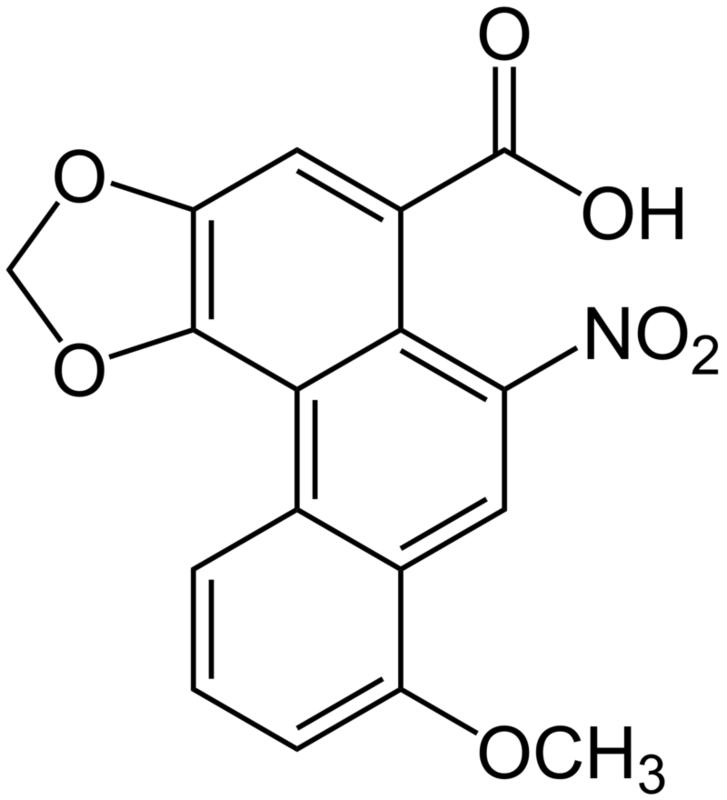 “Renal Toxicity of Aristolochic Acid in Rats as an Example of Nephrotoxicity Testing in Routine Toxicology.” Archives of Toxicology 67.5 (1993): 307-11. 7. Jong, Ting-Ting, Maw-Rong Lee, Shun-Sheng Hsiao, Jar-Lung Hsai, Tian-Shung Wu, Shu Tuan Chiang, and Shao-Qing Cai. “Analysis of Aristolochic Acid in Nine Sources of Xixin, a Traditional Chinese Medicine, by Liquid Chromatography/atmospheric Pressure Chemical Ionization/tandem Mass Spectrometry.” Journal of Pharmaceutical and Biomedical Analysis 33.4 (2003): 831-37. Tags: aristolochiaceae, aristolochic acid, asarum, Chinese Herbal Nephropathy, hexastylis, nephrotoxic, wild ginger. Bookmark the permalink. I was reading about gruit ales and had come upon this article: http://www.vianegativa.us/2004/05/devils-plaything/. That’s when I noticed he used wild ginger and immediately thought back of your article here! I homebrew myself too. Interesting article you linked to. I have a post on sassafrass (safrole) as well, it’s the “root beer” post. I was at JCRA again last weekend, and noticed the Aristolochia plants that they have there, mixed in with the geophyte border… is it just me, or do the bruised leaves smell a bit like burnt coffee? Is my sense of smell broken? I wouldn’t say broken, everyone percieves things differently. I haven’t been there in a few weeks, but some of them, to me, have an anise/licorice type smell to them, so coffee may not be too far off. The ones I have at home are still in good shape, and don’t have much of a smell. those plants were Aristolochia genus… we have some of the Hexastylis here at home, and yes, they smell like licorice to me as well. Hate that they are toxic.